I was very interested to see the website re Foss Cottage, Sea Rocket and East Prawle and the book you are writing on the history of the village. 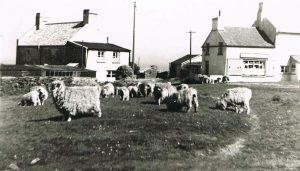 East Prawle village Green with sheep grazing. Postcard, Kittiwake and Windfall at the back, with the shop on the right. My father moved to Prawle in the late 50’s, moving into what was then the little shop and guest house on the village green “Vue Charmante” now a gallery (well it was on my last visit). Larry was running the “Pigs Nose Inn” in those days. Dad and my step-mother [Harry and Mary Ashen] then moved to Rosario opposite the post office, and later took over the Piglet stores. They also had Rosario Cottage. We spent all our summer holidays there with the children. After Dad moved away, we used to rent Foss Cottage for family holidays! We knew Phyllis Putt and also Mrs. Easterbrook. Such happy memories of the place. It must be 6 years at least since we last visited the village. My father and step mother moved to East Prawle and bought Vue Charmenté in 1957/1958. They bought the house and shop from Miss Mapplebeck [who ran the shop sometime between the late 1940s and 1950s]. I did not move there with them but my sister did and she went to school in Kingsbridge for a short time. The village green was just long rough grass then. They bought Rosario after that. When Larry Wootton had the pub [Pigs Nose] it was always great fun and non conventional drinking hours. He used to have a jar of ground ginger on the counter which you added to your half of cider. Half a pit of sweet and half of rough mixed cost 1/6d – at Salcombe the same cost you 2/6d! When the pub “closed” around 10.30 you used to carry your drinks up the steps to the room above, and all the bar lights were turned off just in case the local “Bobby” was around. After Larry left the pub I think it was Graham who moved in [late 1960s early 1970s]. The pub advertised as opening under new owners and opening now at conventional opening hours! My dad and stepmother bought the Piglet stores when Larry left (I think). They ran it for some years. We knew Ben and Ann Newport who ran the Pigs Nose more recently. The mid-late 90s? Great coincidence, my husband and I walked into the pub one lunchtime when staying in the area. My husband did a double take “Ben what on earth are you doing here?” They had both worked together in London a few years previously! Small world. We actually thought about moving to Prawle too. What made my father move to Prawle? Good question. My parents had recently divorced and I think Dad wanted to start somewhere new. My parents knew South Devon from holidays in the 1930s – Brixham and Salcombe. Glad he moved there as they were the best holidays for us as a family. Another name that comes to mind. I think that Dr Wassermann (or similar name) lived in Foss Cottage then [he did]. And there was Derek the milk, but that might have been more recently?